In the wake of the recent Fukushima nuclear disaster, Japan is taking a good hard look at its energy plans going into the future. In particular, it hopes to phase out nuclear energy in the coming years in favor of its vast geothermal energy reserves. Already the government has shutdown the Hamaoka nuclear plant near Tokyo, with other plants potentially on the chopping block as well. So far, geothermal has not played a large role in Japan’s energy portfolio. The country currently only has 18 geothermal plants, providing only 535 megawatts of power, or 0.3% of Japan’s overall electricity generation. Such a small contribution from geothermal energy is shocking considering Japan is the host to abundant geothermal energy beneath its volcanic geology. Wouldn’t the country want to tap into such an abundant source of clean and sustainable energy? 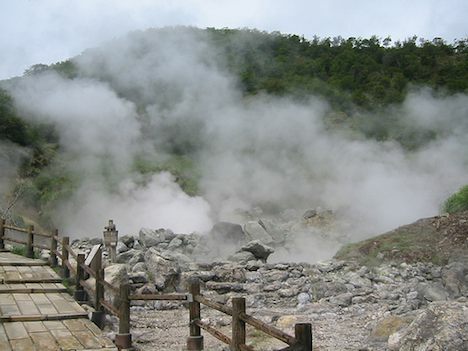 Unfortunately, it seems some of the best sites for geothermal energy are also home to onsens, or hot spring resorts. Ownership of these onsens date back several hundred years, and unsurprisingly, onsen-owners worry that geothermal exploitation would negatively impact their hot springs and economic livelihoods. But with nuclear now out of favor with the government, some onsen owners may have to make a deal for geothermal power expansion. If Japan were to go all the way with geothermal, they could easily equip themselves with huge stocks of clean, renewable power. A recent report by the Earth Policy Institute revealed that Japan could implement 80,000 MW of electricity capacity from geothermal alone. All the negative consequences associated with the Fukushima nuclear disaster have allowed Japan to rethink its energy policies. After all, Japan is a place known for its tectonic activity, and the risks associated with nuclear are now all too apparent. It would be a smart move to work with the energy resources the country has in abundance (i.e. geothermal) rather than continue with an energy form that is risky given Japan’s geographical location. Next post: Are We Starting To Outsource Human Memory To The Internet?